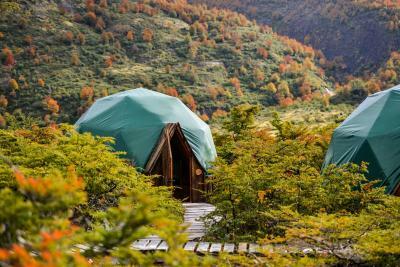 Lock in a great price for Ecocamp Patagonia - rated 8.9 by recent guests. 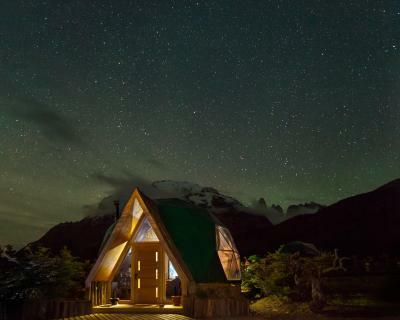 Fantastic location nestled amongst the mountains. The food was delicious and plentiful. The staff were kind, attentive and professional. Great location, very good dinner and plentiful breakfast. 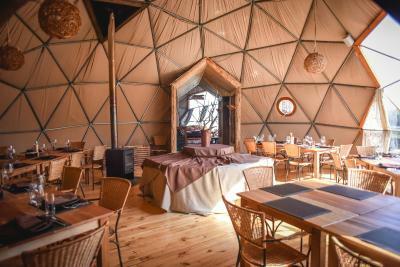 The domes, the location, and food - in particular, dinner - are great. 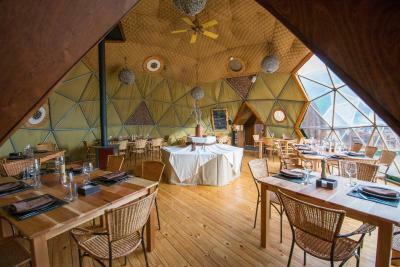 Great eco hotel, great setting on top of the mountain with an overview of the landscape. Shared toilets were clean and has hot water. Food was lovely. What is there not to like? The place is amazing! 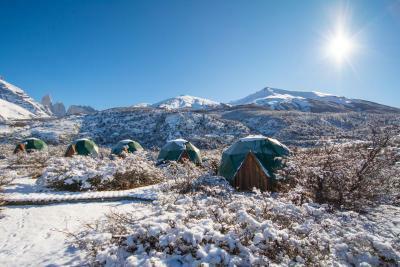 Right in the middle of the park, surrounded by the most beautiful mountains and wildlife, this place truly is exceptional. The staff was extremely helpful and friendly, the breakfast was amazing and the diner maybe even better. 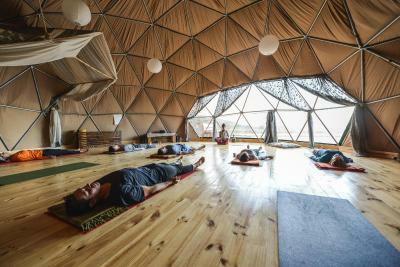 There were free yoga sessions in the afternoon, free snacks all day and a really nice communal area. 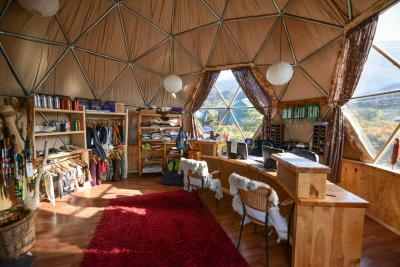 We stayed in a basic dome, and it was all we needed. 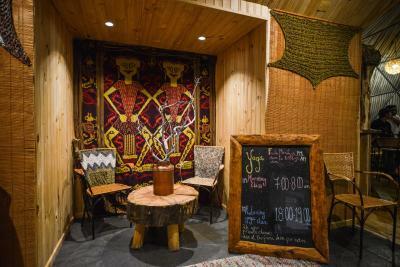 It's just a really cozy (but big enough!) and romantic place to stay. Besides the room itself, also the shared bathrooms were nice and clean. The full board is amazing; especially dinner. 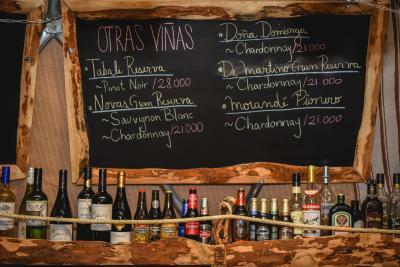 Great wine included in the price. Lovely location and good clean facilities. 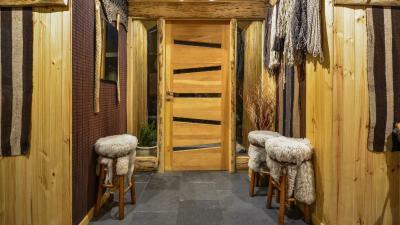 The location is superb and the experience of staying in such a unique hotel is what you pay for. 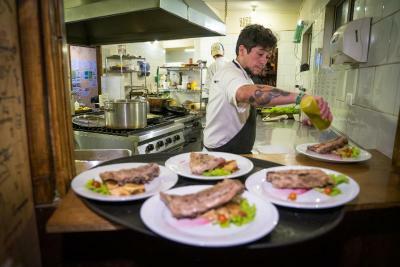 The food was very good and the staff were knowledgable and very helpful. Fantastic hotel, great food, very attentive staff, wonderful view of the Towers. 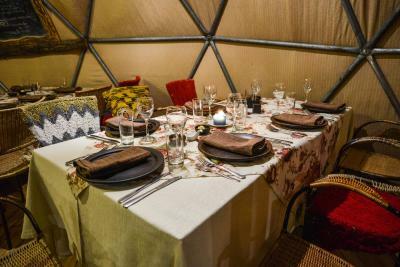 The standard domes don't have private bathrooms, heating or energy (only some flashlights), but it's a very interesting experience for only a few days. 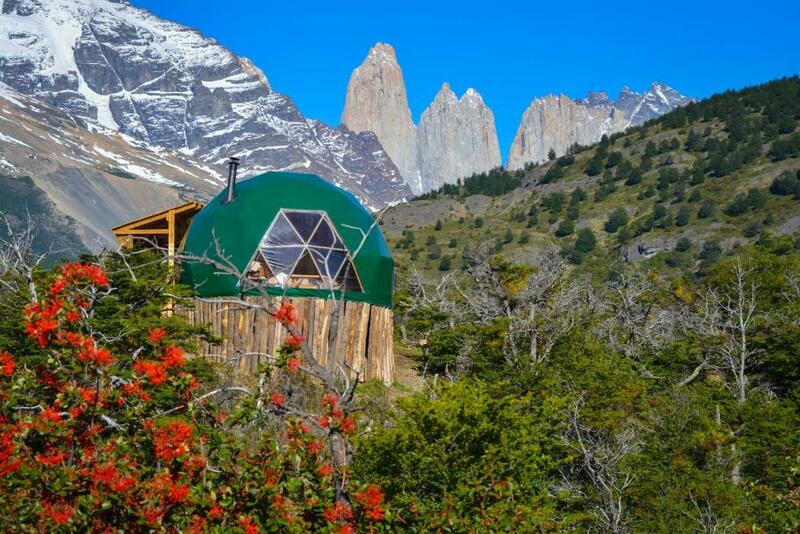 Located in the heart of Torres del Paine National Park, EcoCamp is set in charming domes inspired by the ancient dwellings of the region. Guests may choose between standard rates per night or all-inclusive rates with full-board and additional activities. 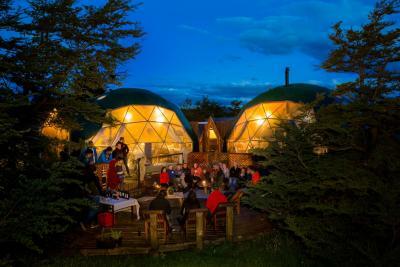 At Ecocamp Patagonia guests sleep in sustainable domes and eat meals in large community domes overlooking the majestic hills. 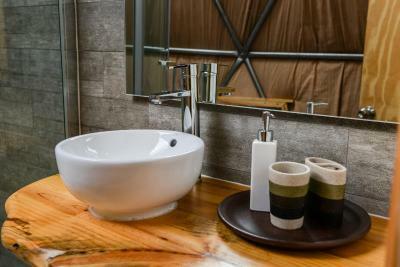 These are fitted with private or shared bathrooms, wood stoves and private terraces. 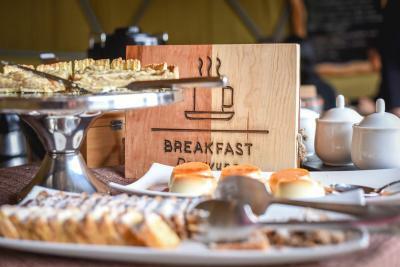 A complimentary buffet breakfast is served in the dining room while drinks can be enjoyed at the bar, lounge or outdoor terrace. Guests travelling with all inclusive rates are served a complimentary lunch and dinner, otherwise these are available for an extra fee. 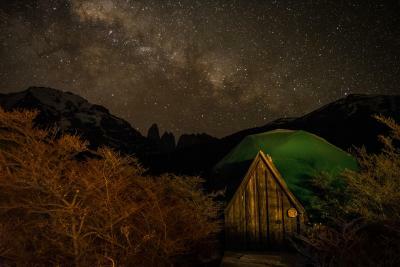 At Ecocamp guests may choose from an array of guided activities organized daily, including visits the Cueva del Milodón and Torres del Paine National Park. These are available for an extra fee and included for guests travelling with all-inclusive packages. EcoCamp is located 3.1 miles from the Amarga Lagoon Ranger Station (1 of the 3 national park entrances). 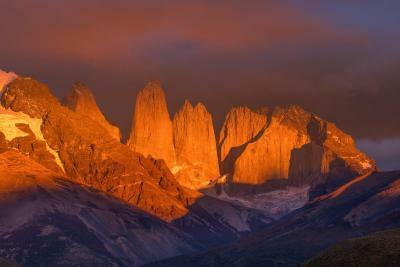 Torres del Paine National Park is located 248.5 miles from Punta Arenas Airport. Shuttle services can be arranged for an extra fee; these are included in all-inclusive rates. 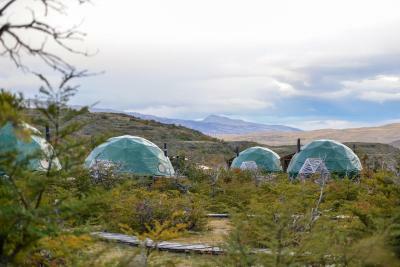 Ecocamp Patagonia has been welcoming Booking.com guests since 21 Oct 2011. 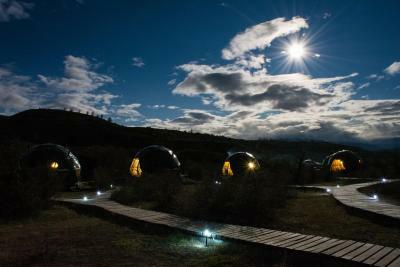 When would you like to stay at Ecocamp Patagonia? 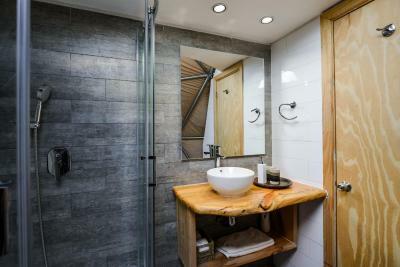 This room features shared bathroom facilities and a magnificent view. Please note the room does not feature heating or electricity. 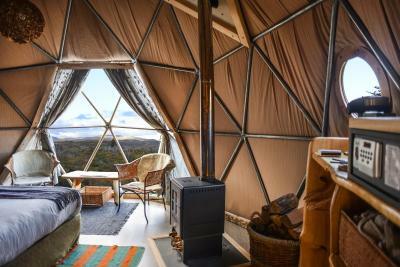 A spacious tent offering sky views. 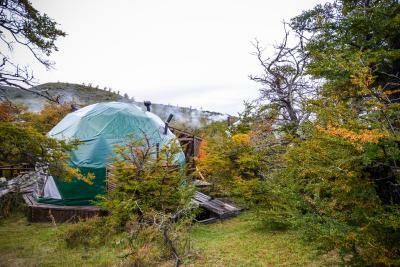 This tent features a private deck, a wood stove and private bathroom with propane heater. An extra bed can be accommodated. 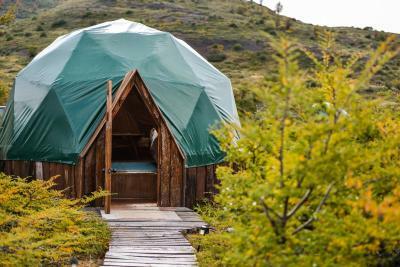 This suite, built on a dome, is fitted with heating, a private bathroom with free toiletries and a balcony with a view. 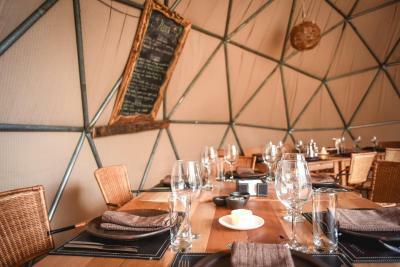 -Soft drinks and snacks not included in the meals served at EcoCamp. 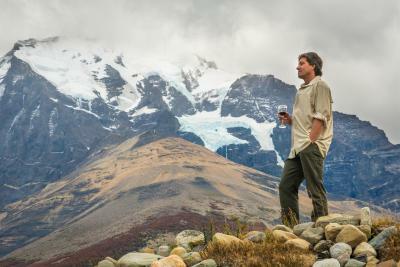 Guests are asked to bring cash in order to buy drinks, snack and souvenirs in Torres del Paine. 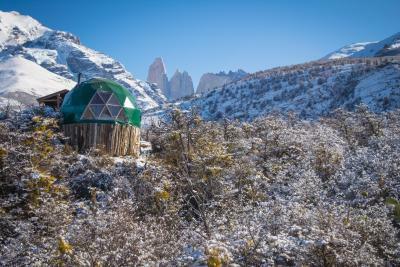 House rules Ecocamp Patagonia takes special requests - add in the next step! Ecocamp Patagonia accepts these cards and reserves the right to temporarily hold an amount prior to arrival. 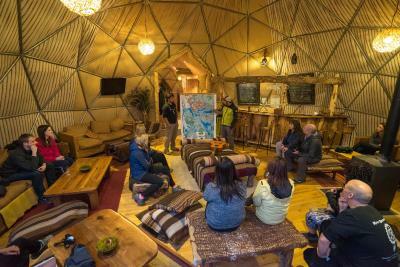 We were in the standard domes and it was cold at night but the staff had plenty of blankets and the common areas are toasty warm and comfortable. We booked on booking.com, not with a tour package. 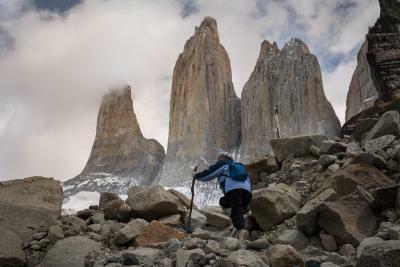 Although all of the options where open for us to join any of the expeditions, it took a bit of work with the staff to seek out the information. We where left alone to figure this out. They could integrate non-tour booked people a bit better. Fantastic position and the food delicious. Everything was great we only wish we had more time there. We finished a day hike later than anticipated and had some difficulty finding the road to the property which made us quite late to dinner. It would have been good to know that we had been booked in for a specific dinner time and if there had been some more signage to get up there with a car that would have helped. Despite our lateness staff were extremely accommodating so it wasn't a big deal. 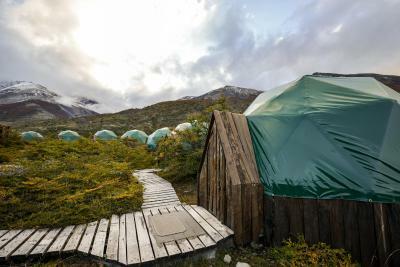 In hindsite I would check in the day before a big hike so you can enjoy the facilities! - Community toilets are very sorry already in the early evening but cleaned once a day only. - Staff provides wrong or no information, eg., hiking opportunities, bus schedules, lunch oppurtunity in-house, and breakfast times. - There was no yoga teacher (although advertised), the yoga some itself is nice. - We paid double. The staff member told us that it is not paid yet. Due to the lack of wifi, we could check whether we were charged already. Later we needed to contact booking and waited a week or more for the refound. Remember, was 345 USD. - Potential is great,but we have the feeling that it is poorly managed. 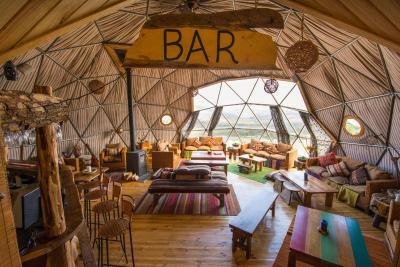 Hmmm, it's really hard to dislike something at Ecocamp, but I'd have to say that the bar (the only thing not included in our stay) was excessive. I mean, more than $10 for just a normal beer is a little over the top. 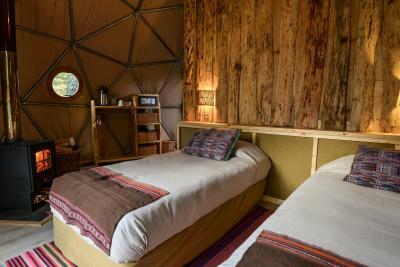 We knew we were getting a standard dome no electricity room but the dome was so cold at night that our pillows felt like ice. Surprised the domes released heat that fast. Staff were hit and miss with lots of miscommunication. 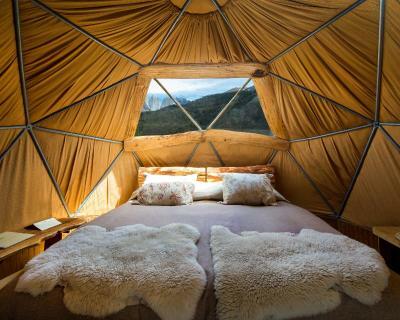 Very expensive for a dome with no heating or electricity. The description and price of the basic/standard room is rather misleading. They really are very small and paying £200 for basically a tent is too steep. 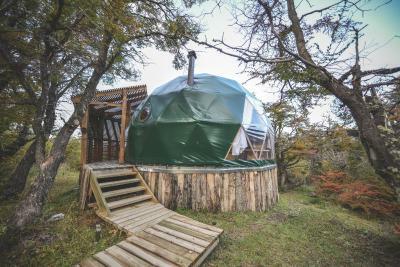 Upgrading to a heated dome was an additional fee of $150 but made all the difference and turned what would have been an expensive and austere night into a more expensive but much nicer experience! 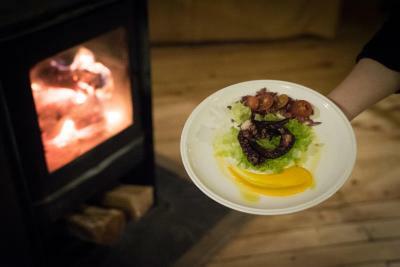 The thing we less liked was the dinner at the EcoCamp. Everything was set to be a like a gourmet experience but the food was not great for my liking. I would rather have simpler foods with better taste. We stayed in a room without electricity and heat, however the room was very comfortable and we didn't feel cold all night. 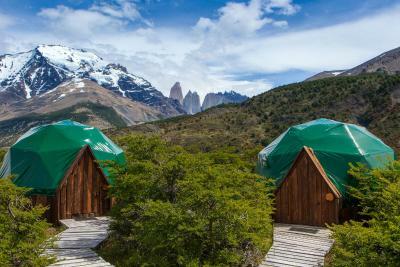 Our room had great views of the Torres del Paine. 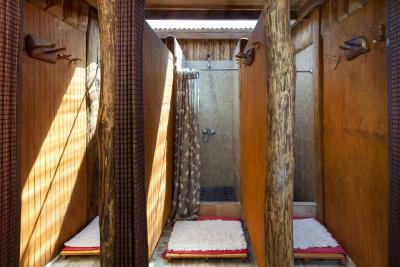 Shared toilets and showers were very clean and I didn't cross with anyone in there. Staff at the bar were very friendly, we had welcome drinks and snacks when we arrived. Selection of food for our lunch box was also very good. 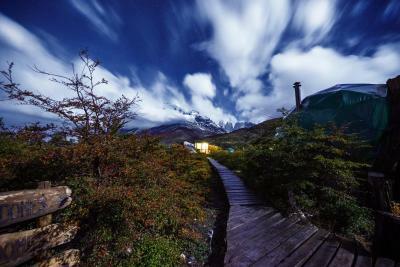 The hotel is very close to the beginning of the trek to base of Torres del Paine, so it is ideal to stay there before and/or after your trekking day. 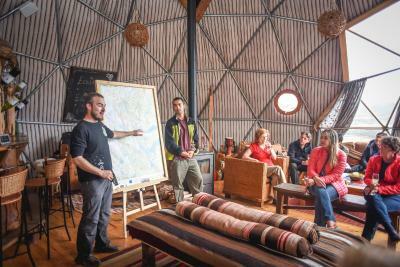 There hotel also has organised groups for different hikes and tours around the park but we didn't use any of them. A room temperature control and safety guard around the wood-burning stove would make it even better.